For now I’m reading the two sides of their stories-I will add their views at the end of this piece. Faesal, who according to the J&K government website of current employees, as August 07, 2018, Faesal is pursuing a Mid-career on Master Programme in Public Administration, at the Edward S. Mason Harvard University, also, the an employee with the title of Senior time scale 15600 39100 Plus a GP of 6600. And Makhdoomi lives outside the crude reality of Kashmir. Both scholars with political tendencies—Even if they part from their scholar research for “truth.” Politics like the devil are in the details. Anyway, I digressed from my paper to comment on Faesal’s retirement to join the pro-India National ConferenceParty, said GK. After reading Makhdoomi’s comments, I have to agree with every one of his statements. He is one hundred percent right on Faesal. Faesal is an opportunist working his way up into the system and he is appealing to the people’s simpathy to climb up. I want to think than me being a total stranger of the Kashmir struggle, an outsider per say, well other than learn it from conversations with Kashmiri, blogs, alternative media and Indian official channels. I believe I can analyze a move like a spectator of a chess game that is sure, he knows better the next move because he doesn’t hold the stress of the game. A little background of my interest for justice. Back on 2003, I attended Richie Corrie’s parents lecture and a plight for help to continue their daughter journey to liberate Palestine. Since then I became an active member of the Palestinian Solidarity Movement. My activism came with attachments. I couldn’t activate only for Palestine as I learn of Kashmir struggles. I have tried my best to stay informed and tell others about Kashmir. Social-economic convenience block, where all workers of the Indian occupied Kashmir government infrastructure fit. Majority of them live for the most part with a decent salary and are more or less comfortable with the situation. Internet or electricity cuts often seen by them as something out of control, but part of the Indian apparatus administration. Political aspiration persons, those who take a political post with hopes to climb the ladder of power. They see the freedom fighters as a nuisance to their political career and will do anything to win the favor from India and at the same time keep happy and at bay the Kashmiris. They stay away from speeches that denounce the Cordon and Search Operations (CASO,) that usually end up killing resistance fighters and civilians, also they are mute of disappeared persons. They live in a small world, almost forming a block with J&K government w m orkers. In other words these two blocks are the cushion that sustain Indian occupationfrom crumbling. Political career persons, usually Pundits, Sikhs and Muslim Kashmiri persons who managed to position on posts of power and pretend India will stay forever as it is. Same as the political aspiration block, they see the struggle as a nuisance to their political post, but they enjoy more freedom both of speech and movement. Survival modus operandi group, all those people who care less for their neighbors but only care to bring food to the table. Intellectuals, all people who make a living out of the conflict, being lecturing around the world, writing books and/or giving interviews to TV stations, magazines and newspapers. Scholars and university students, the real thinkers of Kashmir. They are full of ideas on how to liberate Kashmir. They are the energized block of the population. Fresh minds who want the best for the land and the people. They are continuously studying the solutions and seek freedom from foreign powers but they entertain the cons and contras of compromise. All parties Hurriyat Conference. They seem as good people with different solutions for the same problem. They are persecuted by the system but they want the goodwill of the people. Even though they have observer status at The Organisation of Islamic Cooperation, it seems that Kashmiris don’t enjoy any protection from the 157 members states. The only worthy thing they have “achieved” for Kashmir is the official publication the Office Of the United Nations High Commissioner for Human Rights report on June 2018. The resistance fighters, the real heroes who can not see oppression, occupation, and repression as something irremediably, they seek the solution now, yesterday was late for self-determination. They can not compromise on the land. They see the martyrs as a sacrifice to the land, usually Muslims who see in martyrdom exchange for paradise. And finally the common Kashmiri farmer and their family, and the common worker, both blocks of the population seek nothing but their land as an inherited right. They cheer for the martyrs, freedom fighters escapades, but also they cheer for the leaders that promise “things.” In their naiveness, they believe the political figures that give great speeches are true leaders. What I see from far away is that the Kashmir Valley is subject to religion extortion from the Islamic Republic of Pakistan, and a cruel military occupation from India. Both nuclear powers are playing a chess game in Kashmir and they are sacrificing all the pieces. The Valley is drenched with blood, the mothers are mourning their martyrs while politics plays high in round tables with endless discussions going no where. That is the scenario I see from my vantage point. Last week the White House stopped its funding to UNRWA, the agencyiin charge of supporting and protecting Palestinians refugees. At this point is expected that it will continue its mission through personal donations. According to uts official page, UNRWA also receives funding from the European Union and partner organizations. Skipping the middle man! This could be the best opportunity to sideline the US government, which have been the main obstacle for peace in Palestine—The US Congress also is to blame having funded the Israeli’s military with billions of dollars. This funding have emboldened Israel. At this moment the future of UNRWA US is unsure. I share their page, but I’m skeptical if the funds can be delivered directly to the occupied territories without official channels. Also taking in consideration that Israel receives the money before is handled to the Palestinian Authority. UNRWA is a non-profit, that functions as a direct dependent of the UN, which was funded in the same year the agency was funded–In 1949 UNRWA was created with the sole purpose to assist and protect Palestinians dispossessed of their lands, homes and livehood after the partition. At this point we don’t know what is going to happen to UNRWA. It is true several countries and private organizations also help in its funding, but we need to hear more information from the WH regarding its standing regarding UNRWA—Will the WH allow UNRWA to function without government interference? Global water management not Carbon Tax is what will take world leaders to save humanity from a catastrophe; at least some pockets of it. I’m not scientist but my common sense tells me all this “climate change scenario,” has nothing to do the political global warming rhetoric and everything to do with water management and deforestation–Considering the fact that earth is a live organism, that is suffering from “dry surface syndrome,” –I coined this term to explain earth needs of water replenishment. Earth is doing what every organism will do to survive; Earth is melting its continental ice sheets to make up for the disruptions of the natural rivers flood and permanent damage done by the construction of dams. Just California has 241 dams disrupting the ecosystem. Last February Oroville Dam had a rip in its spillway system that send almost 200,000 residents to evacuate their homes. The Oroville Dam is one of the 5 biggest dams in California. Dams is another them altogether but definitively needs to be address when we talk about climate change. Mine is only speculation out of common sense but the next paragraph is a perfect scientific scenario published in Athropolis “If the Arctic ice cap (of which the Greenland ice sheet is a major part) was to melt and disintegrate, the consequences would be catastrophic. Think of the ice as a giant white reflector – with no ice to reflect sunlight and heat in the summer, the entire radiation balance of the Earth would change. It doesn’t take a genius to figure out this. Although I do not deny climate change, I do not believe that politicians are taking the right approach to avoid a catastrophe. I do believe lobbying companies are paying scientists to manipulate data. I believe that some of the data published in the last 25 years was manipulated by the people behind the movie “Inconvenient Truth” to sell us the carbon tax. I also believe our climate change has more to do with the rivers, oceans and deforestation and less to do with pollution. “That same concern today moved to the estate of the “climate summit” to mark the Action Day, which formed the oceans main part of the exhibits to be considered “the largest and most important ecosystem protect”. Why it is important? Yolanda Kakabadse, President of the World Wildlife Fund (WWF) explains it perfectly: “Instead of talking about Earth, we should call it Planet Ocean. If the oceans were a country, they would be the world’s seventh largest economy”. Oceans produce between 50 and 80% of oxygen and consume more than 25% of carbon dioxide (CO2) of the planet. That is, as we had anticipated conservationist and primatologist Jane Goodall, along with forests, one of the main ecosystems of which depends on human and animal life. But unfortunately, in both cases the negative action of man is greatly affecting their conservation. If you trap the water responsable for the ocean currents and cut all the trees what do you expect will happen to earth? Next time that that you hear climate change think on how you can change your print on the planet. In the long run the relation of the President Trump with the press can erode to the point to become a dictatorship right in front of our eyes. President Trump disregards the press as dishonest. It seems obvious that President Donald Trump wants to delegitimize the media and has being doing it so diligently, making it appear as a harmless game, but in reality Trump is pushing the media out of the White House. He easily refers to media as fake news, not even allowing the reporters that question his actions as our president to speak up. This undermines the role of media in our democracy. By doing this, reporters he chastises are silenced and essentially invisible. Not only does President Trump undermine the role of media, but with his use of his personal Twitter account as a medium to release information related to his activities as a commander in chief, he bypasses the media and acts his own spokesperson, even. He breaks a traditional flow of communication around the White House and this behavior has his advisers trying to find a loophole in the security apparatus of the presidency in their attempts to excuse Trump’s disregard for the rules in place for a sitting president. For example, traditionally the White House Press Secretary’s primary role is to act as spokesperson for the president. The Press Secretary tells the public what the president is doing, and reporters get to ask questions about it. President Trump’s constant Tweeting does not allow for this regularity, making it difficult at best, if not impossible, for his own spokesperson to do his job. Also, Trump is attacking TV networks calling them “dishonest” and “FAKE NEWS” at every opportunity he has. Trump has developed the mania to call TV networks dishonest if they do not broadcast news favorable to him. 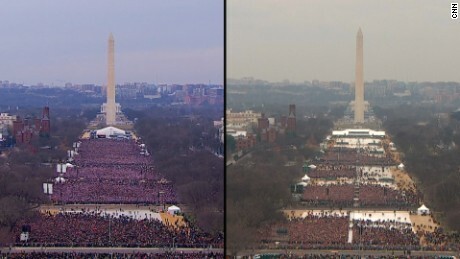 His first tantrum against the media as Commander in Chief was the day of his inauguration as the 45th president; CNN and Vox published photos side by side of Obama 2008 inauguration with Trump 2017 inauguration, showing a much larger crowd for Obama’s inauguration. This photo got Trump so mad that he called National Park Service, upset over the inauguration crowd. According to ABC, “President Donald Trump called the National Park Service’s acting director the morning after his inauguration to express displeasure over a retweet of inauguration crowd photos from the agency’s official account, according to the White House.” To put the “rumors” to rest, President Trump, had a photo by Abbas Shirmohammadi, who had been involved in creating images of presidential inaugural since former President Ronald Reagan, placed in the upper/lower press hall. By replacing inauguration day photos to glamourize his own popularity, he is manipulating public perception, which is something dictators have been known to do. Trump seems obsessed with tweeting his news directly to his followers. It is unorthodox that a sitting president tweets information rather than allows his press secretary to speak directly with the press in case there are questions that need to be answered. I have instructed Homeland Security to check people coming into our country VERY CAREFULLY. The courts are making the job very difficult! In his final press conference Obama defended the role of the press and he joked a little bit with them. Obama maintained a cordial relationship with the press because he understood that the press is the only one that can demand accountability from the White House. Patriots and heroes fall in the same category; a patriot is a person who vigorously supports their country and is prepared to defend it against enemies or detractors. And a hero is a person noted for courageous acts or nobility of character. Secrets that should not be hidden from the people. In this era of government’s secrecy, whistleblowers are patriots no less important than heroes that take the risk on their lives to expose the darkest secrets of governments. Edward Snowden, the 29-year-old former NSA technician is my favorite whistleblower and hero because his revelations have the most benefit for the people not just in the US but for the whole world. He told the Guardian he worked for a major U.S. government contractor in Hawaii, earning a six-figure salary and enjoying the scenic state with his girlfriend. And he chose to leave everything behind to alert the public of the massive government surveillance program. Snowden said that governments should be a transparent agency that work for the people and should be accountable and hiding secrets is not the best way to serve the people. He is a hero in all the extension of the word and he should to be protected, defended, and supported for what they endeavor; in doing so, we will be defending ourselves, our privacy, security and most importantly defending our constitutional rights that, ultimately, are the only protection we have. Some of Snowden’s leaks suggested the NSA had misled Congress about the scope of its domestic spying activities. In a Senate hearing, Director of National Intelligence James Clapper lied when asked if NSA collects information on Millions of Americans. We only know that NSA spy on all of us thanks to Snowden’s revelations. Now we know better not to say things in the phone that can be heard by prying ears. Julian Assange, editor of WikiLeaks, although not a whistleblower in my opinion is an extraordinary journalist who has tasked himself with serving as a vehicle for whistleblowers to leak governments’ secrets and publish them WikiLeaks. Recently President Donald Trump said the government will prosecute those who leak government secrets, in my opinion Trump is trying to instill fear in journalists, not only on whistleblowers. Remember it was the New York Times who revealed the Pentagon Papers and The Guardian that published Snowden’s revelations. I believe whistleblowers feel people deserve to know the truth, even as the government hides and denies the facts. Whistleblowers put their lives at risk for the sake of other people making more informed decision, which is an heroic act. I chose the photo above to give you an idea of how an organic protest looks like. Nobody is throwing chairs around, or insulting each other. Nobody is using incendiary material or being disrespectful to students, faculty or staff. What you have seen on national television relating to the latest violent protests after Nov. 8 elections, are not organic protest but organized by elements of our society that want to create fear between the population. What you see on television does not reflects the present state of our country but groups of people easily managed to be enraged by emails being sent by MoveOn.org, Jewisch Voice For Peace, Courageous Resistance, and other organizations behind Clinton’s agenda. I refused to accept or follow the fear incitement campaign started by left-wing elements of the democratic party in association with mainstream media and financed by corrupt money. The same way that righ-wing people and organizations are branded right-wing by their radical leaning to the right and yes, but their disregard of the views and interests not aligned with their ideas and agendas–the left which for years have been nested inside the democratic party for being progressive and liberal, now days, it has fell in the same category of radicalism and fundamentalism, where is their agenda which only matters. They have proven not to care for people and I’m talking about the Democrats, they become too cozy with the profits they gained from the corporate world. The establishment refused to persecute Hillary Clinton. They kept looking in the wrong emails’s batch. Why not used Wiki-Leaks emails. Assange put them in a silver plate for the FBI and the District Attorney. The New World Order’s ideas were brewing inside the corrupt Democratic Party heavily financed by the banking, arms, pharmaceutical, energy conglomerate, and shamelessly by foreign powers as well. Those NWO’s ideas wanted to take United States to World War Three. Hillary Clinton was so fired up to declare war with Russia and attack Iran, all for her obsession in defending Israel’s security. Wouldn’t an American public official be more interestd in defending the right of the American people, our economy, our security and not being waging war defending Israel’s security, which it a foreign nation that only get us enenmies. Why is the media cheering for the Soros -incitement “protests”? Are you fueling fire for a violent revolution? The billionaires club profit from revolts; big and smalls. They do not care if you become homeless, refugee or if you die. Either way they [corporate magnates] will make money building weapons, homes or caskets, and even will make money with television adds broadcasting the American Revolution. Why is people jumping in the bandwagon of discord? The electoral college is the way our democracy system works, deal with it. Before I pronounced my next statement, let me make clear that I’m independent, that Voted for Jill Stein. Saying that, I feel more comfortable writing the following. Unfortunately a big number of the American people voted for the lesser evil, and what is done is done. Donald Trump won the elections and we must work united to defend our republic, from him, or from who ever want to take our constitution rights from us. We have the Constitution to protect and to protect us. We won’t allow the president to take us backwards in our victories in the Supreme Court, but we cannot defend our rights destroying public property, attacking the police and simply yelling in the streets. Not even trying to reverse the electoral college. Only because Hillary Clinton did not win. At least not a day after the elections and not through violence. Organize and work in your districts. Make your council members accountable for their mischief as public officials. Force them to come clean with the deals they make behind doors with corporations before they sign bills. Get involve in the political system of the country, inform yourself in the mechanisms of local, state and federal laws and politics. If you invest the energy you are spending being mad in the political process, we can move forward and demand from Trump a different administration away from the corrupt one you know. Trump is not more powerful than our Constitution. “We have to remember that we’re actually all on one team…We are not Democrats first, we’re not republican first, we are American first. We’re patriots first. We all want what’s best for this country.” Barrack Obama addressed the nation, a day after the elections, on Nov. 9. This article was written to respond to Jeffrey Goldberg in the Atlantic: The Paranoid, Supremacist Roots of the Stabbing Intifada, where he said his version of the story going back to 1920 through 2015: Palestinian leaders incite violence now as they did in 1920. The current stabbing Intifada taking place in Palestine he said a quasi-uprising in which Palestinians have been trying, and occasionally succeeding, to kill Jews with knives. Goldberg should know that the definition of Intifada is uprising. He used Intifada as part of the name of the article and then he calls the intifada quasi-uprising. Mr Goldberg, it is an intifada or is not. Anyway, going back to Goldberg’s article, he goes on saying that violence, “is prompted in good part by the same set of manipulated emotions that sparked the anti-Jewish riots of the 1920’s; a deeply felt desire on the part of the Palestinians to “protect” the Temple Mount from the Jews” he said. Goldberg does not make any mention of the thousands of settlers and IOF incidents of unprovoked attacks prior to this 2015 youth uprising. No, he prefers to say only what the Israel’s public loves to hear; the eternal victim-hood of the Jewish people wondering in the wilderness looking for God’s promise land; for his chosen people. Let’s forget about religion and come back to reality. 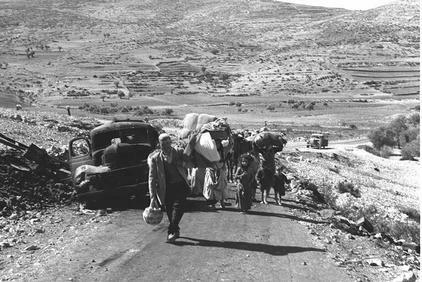 Palestinians have been living in Palestine for centuries as history records. But what is the “Status Quo”? The State of Israel is not “officially” promoting settler violence but it is permitting the violence with the protection of the IOF and Israeli security forces allowing settlers to attack worshipers and allowing the settlers to enter Al-quds with shoes (Muslims need to remove their shoes and wash their feet before entering a mosque) to vandalize inside the mosque. What is the Status Quo in Jerusalem and in the rest of the occupied territories? Occupation of Territories is the Status Quo? Are check points the Status Quo? Palestinian Muslim males over 45 not allow to enter Jerusalem. The South Africa pass laws implemented in Israel are kicking and running. Palestinians need to secure a permit to move around the occupied territories. If Israel feels like it, it won’t grant a permit. Palestinians are not allowed to freely move in Palestine at all. Shuhada Street in Hebron is one of the best examples of living under a military dictatorship occupation. Shuhada Street is close for Palestinians but Jews can freely walk and harass the Palestinians residents that live on Shuhada street but need to leave their homes thru a hole on the roof. Jerusalem is only open on Friday and males 55+, women 45+ after IOF clearance. People living in Gaza are not allow to enter West Bank at all, actually the refugee camp of Gaza is a deportation camp. Families are completely separated. Is the #Apartheid Wall part of the Status Quo? Do allowing the settlers and sometimes IOF escorting them to harass farmers during their work in the field the Status Quo? Do allowing the settlers to harass women in their way to the market the Status Quo? Do allowing the settlers to harass children in their way from and to school the Status Quo? Do allowing the settlers to burn thousands of olive trees every year the Status Quo? Are the demolitions of Palestinian homes, separation and forced eviction of Palestinians part of the Status Quo? Are the separate roads for settlers and Palestinian part of the Status Quo? Is the killing of youth rather than access to courts the Status Quo? Is the harassment of the children of Palestine in the middle of the night to take their photos part of the Status Quo? Is the confiscation of Palestinian land for “security reason” and part of the Status Quo? And also do not forget that the violence is not only in Jerusalem but in all the occupied territories including the modern concentration camp of Gaza which has been blocked from the rest of the world for almost 10 years. So, people do not swallow the pill that this is a religious war, is not.Goldberg makes an excellent surgical extraction of the truth to portray the Israel’s side of the story. For people that only follows the main stream media news, Goldberg’s piece is an excellent source to stay uninformed, misinformed and with this stripping Palestinian of all their humanity and right to fight for their existence in the only way they know; throwing rocks and now using kitchen knives.